April 2008 Home Bar Contest Winner! 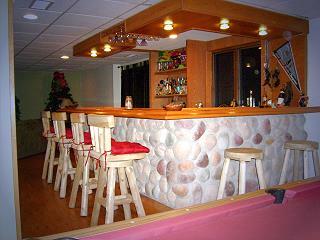 We have a winner of the first official Home Bar Photo Contest. 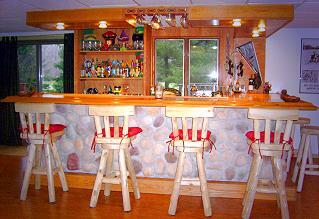 The honors and $50 go to Robert W. of Crete, Ill.
April 2008 Winner: Northwoods Bar Theme Field stone bar front application. 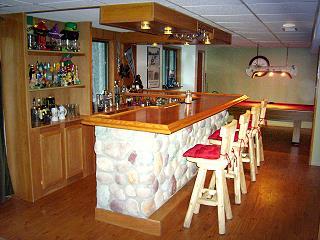 his bar and at least two dozen other excellent projects. 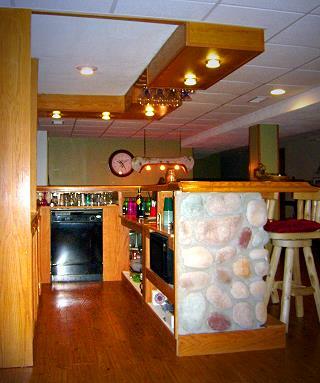 Bob’s craftsmanship and creativity along with excellent overall appearance of the finished project stood out as one of the best. Photo composition also earned Robert the prize by capturing the entire bar scene floor to ceiling and left to right and from four different angles. Thank YOU Bob & Congratulations!